Welcome to Angoulême and thank you for visiting us! Fresh and nutritious breakfast with fresh oranges and a giant juice press, as well as organic eggs to cook! And a little gift for children when they arrive! 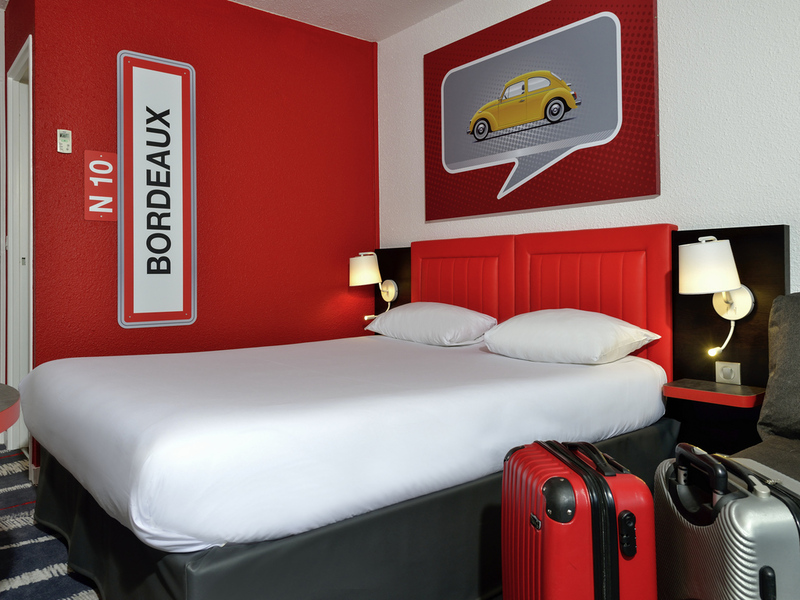 Located on the outskirts of Angoulême, with direct access via the Paris-Bordeaux highway and 2.8 miles from the historic center of Angoulême and the train station, the ibis Styles Angoulême Nord hotel has a large free car park and La Boucherie restaurant opposite. As well as 64 very spacious rooms measuring 248 sq. ft. with 1 double bed and a double sofa bed, the hotel also boasts a 2368-sq. ft. modular meeting room ideal for residential seminars and training days, coffee on arrival, food & beverages. Whether you are looking to organize a seminar, rent a meeting room, or run a training day, come to Angoulême, capital of the comic strip. Close to the famous vineyards in Cognac and Périgord, the ibis Styles Angoulême Nord hotel is also ideally located for walking, cycling or jogging along the Charente riverbank. The ibis Styles Angoulême Nord is 10 mins from the Cathedral, Castle and market hall. Discover the comic strip museum on the banks of the Charente. Direct access from the Bordeaux-Paris highway, and just 8 minutes from the center! A previous stay in an Ibis Styles had been really good so we were looking forward to this stay. It turned out that 'style' was at the expense of comfort and efficiency. Too many irritating small things made the stay a bit of a trial. The plug in the washbasin didn't hold water, so I had to shave under a running tap; the duvet cover was much bigger than the duvet so we were fighting empty sheets; the restaurant across the car park was extremely basic - I would have expected a Styles hotel to have its own restaurant. Big comfortable rooms, each day a free bottle of water, some free snacks and drinks in the lobby and friendly employees. The breakfast was good with fresh orange juice. Couch-bed not done. We had to make our own bed ....... get the blankets, pillow out of the cupboard and make the bed ! As member of the loyality program, i was not registered. I had a room for disable customer while other room seem to be available. The reception has proposed me to change but when I checked in, I did not have the time to change. The room was humid and I had to push up high the aircon to get rid of then dampness. The staff at the reception has been friendly and helpful. We only stayed one night on our way south from the ferry at Ouistreham, less than 5 hrs driving time. The room was comfortable with a good size ensuite and separate WC. The bar served a good range of drinks and the staff very friendly. We enjoyed an excellent meal at the Boucherie restaurant next door. The buffet breakfast was substantial and varied. We registered on line the day before which saved time at check in, and we didn’t need to checkout as I received the bill by email. Personally I thought the hotel room looked a bit out dated with bathroom looking a bit grim. Unable to shut bathroom door without door hitting light switch. Kids complained about the comfort of their beds. Common areas/corridors looked poorly cleaned. With spiders hanging in most corners of the corridor to our room. No additional pillows available. Staff were very friendly and the breakfast was good. Clean room with enough space for a family, quiet environment and very nice and rich breakfast buffet (we love especially the fresh squeezed orange juice. Overnight stay on a long drive from Cherebourg. All that is necessary for an ideally located hotel. Check-in and at breakfast very friendly and helpfull service. Price quality very good. No diner. Spacious room. Gracious staff. The restuarant adjoining was excellent and fun. Very pleasant hotel. We were warmly greeted, no restaurant however, there was a restaurant within 30m, good size bedroom and hot shower. Breakfast was good variety of foods. We would definitely use this hotel again. Monsieur B., Nous vous remercions pour vos commentaires laissés suite à votre séjour à l'hôtel Ibis Styles Angouleme Nord. C’est avec grand plaisir que nous recevons vos compliments. Aussi, nous ne manquerons pas de partager vos appréciations avec toute notre équipe. Votre satisfaction est la plus belle récompense pour notre personnel qui travaille jour après jour pour vous offrir un service irréprochable. Nous avons cependant noté un bémol concernant votre chambre et la salle de bain. Nous sommes désolés que la prestation n'ait pas été à la hauteur de vos attentes. N'hésitez pas à nous faire part de vos suggestions d'amélioration que nous serions ravis de prendre en considération. Dans l’attente de vous accueillir de nouveau, nous vous prions de croire, Monsieur B., en l’expression de nos sentiments les meilleurs. Cordialement, Clémence Rutkowski et toute l'équipe Ibis Styles Angoulême Nord.